Beaufort's Old Burying Ground, which has been around for nearly 300 years, is home to around 400 gravesites, half of which date back to before the Civil War. And despite sharing the cemetery with many soldiers, the Old Burying Ground's most famous resident might be someone without a name, someone only known as Little Girl Buried In Rum Keg. She longed to see England, the place of her birth, and when she was 10 or 12, she begged her father to take her on a trading voyage to London – away from the boredom of a colonial fishing village. Her mother hesitated, knowing the hazards of the sea. But she allowed the trip on one condition: Bring my daughter back to Beaufort. Sometime on the way back, the girl died aboard the ship. Weeks from Beaufort, the grieving father chose his only option short of tossing his daughter overboard. He purchased a cask of rum from the captain and sealed his girl inside. The little girl, still in the rum keg, was buried in the Old Burying Ground upon their return. 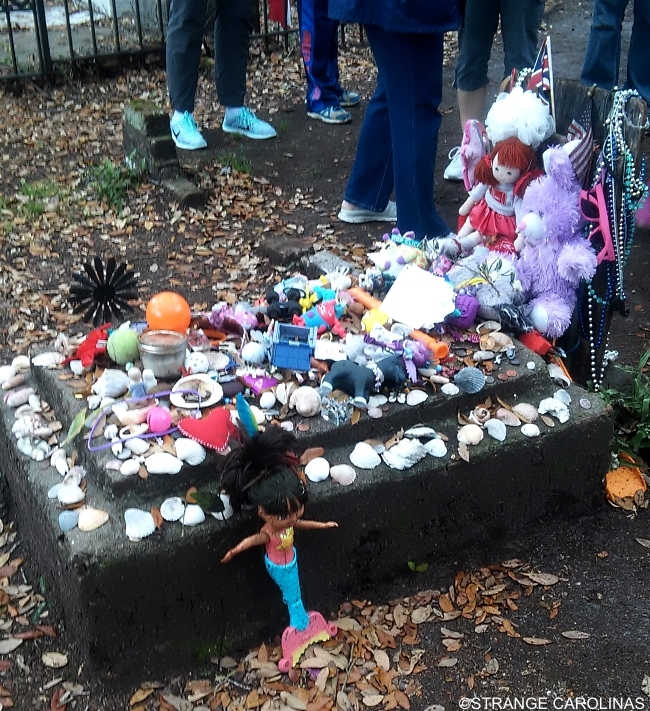 Visitors adorn her grave with trinkets, beads, seashells, balls, toys, and, evidently, Dora The Explorer mermaid dolls.